Goodier Properties is proposing a 60,000 to 65,000 sq. ft. office building at the site of three properties on Key Hwy. 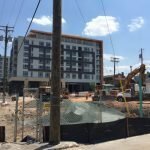 between Woodall St. and Stevenson St. Goodier Properties purchased two of the properties from Sagamore Development and has the third under contract. The proposed five-story building would have an L-shaped design and two stories of below-ground parking. The exterior design, which Goodier Properties is working on with Marks Thomas Architects, will be a combination of brick and metal with large windows. 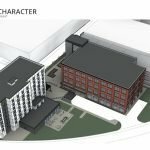 “We want it to be a tribute to the historically-industrial vibe in the area,” said Jon Selfridge of Goodier Properties. The building would be across from Domino Sugar and adjacent to a block of rowhomes on Woodall St. and Stevenson St. The building would abut a home on Stevenson St. and would be separated from a home on Woodall St. by a small alley. The first floor of the building will have a space that could be used as traditional retail or for a professional business that could benefit from a storefront presence, like a realtor or insurance agency, noted Selfridge. Selfridge said that the amount of parking spaces has not yet been identified, but would be in line with zoning requirements. Goodier Properties recently redeveloped the former Syrup KING Molasses building at 1414 Key Hwy. to include 74,900 sq. ft. of office space and 22,100 sq. ft. of retail. That fully-leased project has fueled Goodier Properties’ interest in developing another office building. Selfridge noted that they recently started marketing this building and have already been approached by a few groups that have shown interest. Grossman also raised concerns about the two levels of below-ground parking and the impact it could have on the nearby rowhomes. 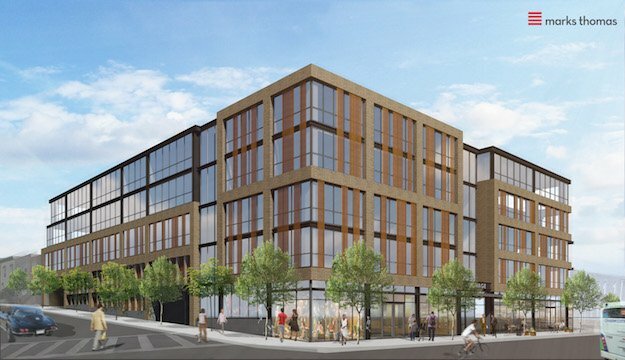 “In general there is not opposition to a commercial office use for that site, but only if the building is of comparable scale to the surrounding rowhomes, and is able to self-park all of its tenants,” he added. 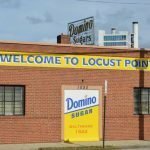 One of the three properties in the project requires a change in zoning classification to a C-2 commercial use which would have to be approved by the Baltimore City Board of Municipal and Zoning Appeals. “We have met with LPCA a few times and they’ve expressed their concerns. We hope we are able to come to a compromise that works for our project and for the community,” said Selfridge. Goodier Properties is hoping to begin construction in late spring or early summer of next year. Construction is expected to take a year.